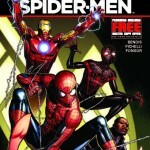 This Issue concludes the meeting between Spider-Man (616) Peter Parker and Ultimate Spider-Man Miles Morales, While the story isn’t as climatic as it should have been it’s still a very good and entertaining for a mini-series writer Brian Michael Bendis humor and wit, most noticeably in scenes with Miles and Peter or Ultimate Iron Man and Nick Fury. Bendis nails each of these characters, Both Iron Man and Nick Fury’s sense of humor resemble its movie counter-part. 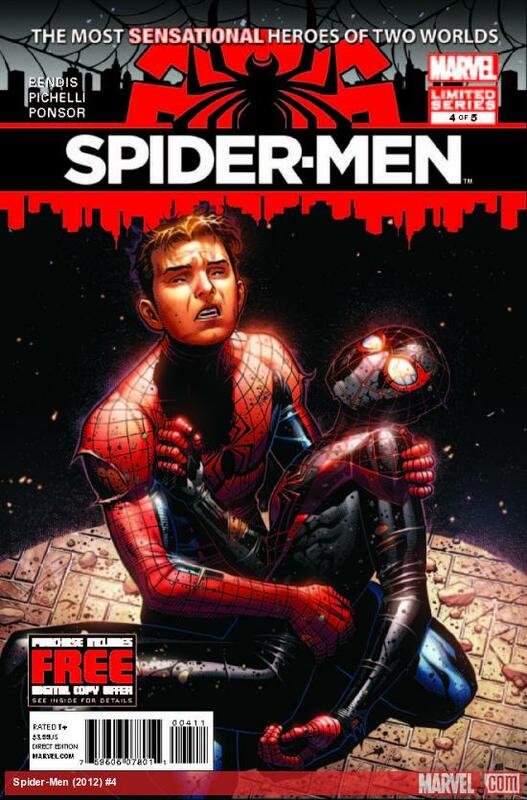 Spider-men #5 consists of a hysterical Mysterio being overwhelmed by the likes of both spidey’s and The Avengers, in a last ditch effort he drops some kind of chemical agent that causes hallucination, but that’s quickly put to rest by Miles who lands a couple of kicks to Mysterio and from there Fury and the others coming up with a perfect solution to deal with the villain, one a few emotional sense come when Peter and Miles say goodbye to one another , as the portal closes Peter shoots Miles a little words of wisdom but is interrupted when the portal finally closes on him, the interesting part is Peter is telling Miles something very important but couldn’t finish. 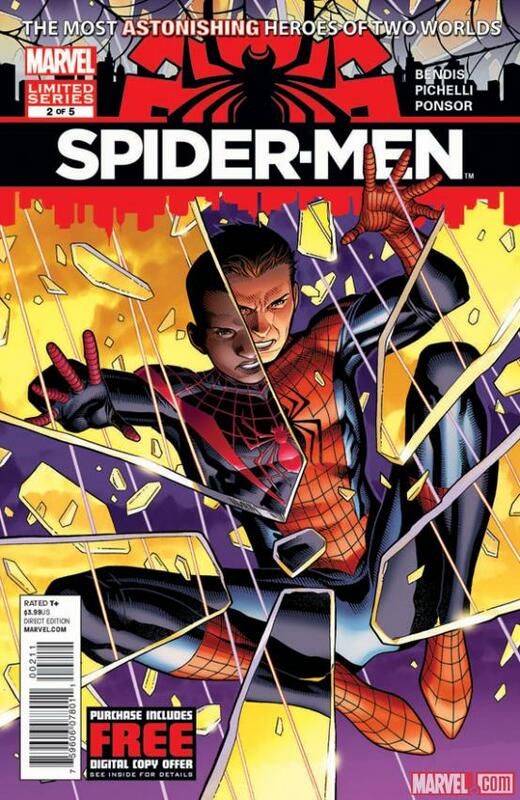 The issue and series ends on a interesting note when Peter Parker back in 616 timeline checks to see if there’s a Miles Morales in his time. If Marvel is smart they should keep Sara Pichelli around for more projects her work is dam near perfect in every issue, one of her strong points to me is her action sequences she nails all the body positions and facial expressions in every panel, Pichelli also blends 616 and Ultimate elements together smoothly throughout the 5 issues, you can say I’m so what of a fanboy to Sara Pichelli, and your probably right, but you can’t say the girl doesn’t have skill when it comes to the pen. 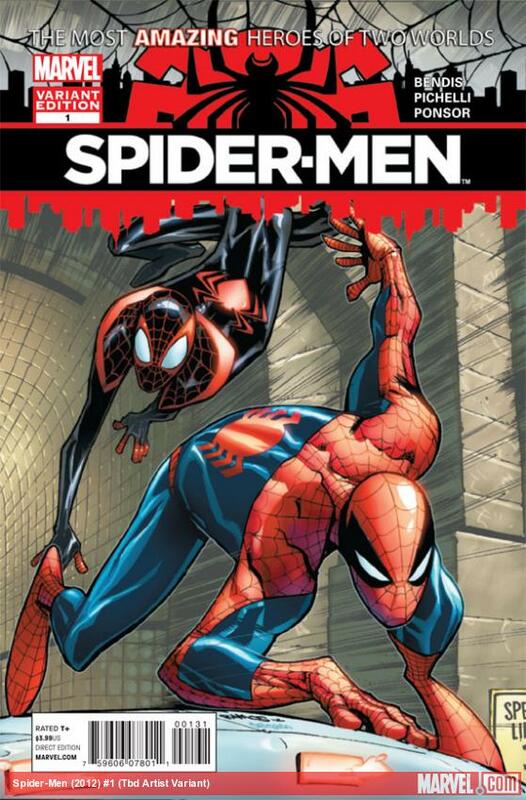 With the crossover ending the way it did I wouldn’t bee surpised if they continue the storyline in the near future, while it may not be a classic Spidey story arc Spider-Men #1-5 is an enjoyable series and has its moments, because it is written so well I think Marvel has something here in terms of long haul I can see Miles as Peters side kick in the 616 universe or Peter making appearances in the Ultimate universe. 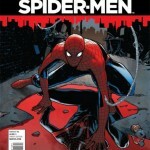 How will the amazing Spider-Man get back to his own reality? Can they move on knowing there not alone in the universe! 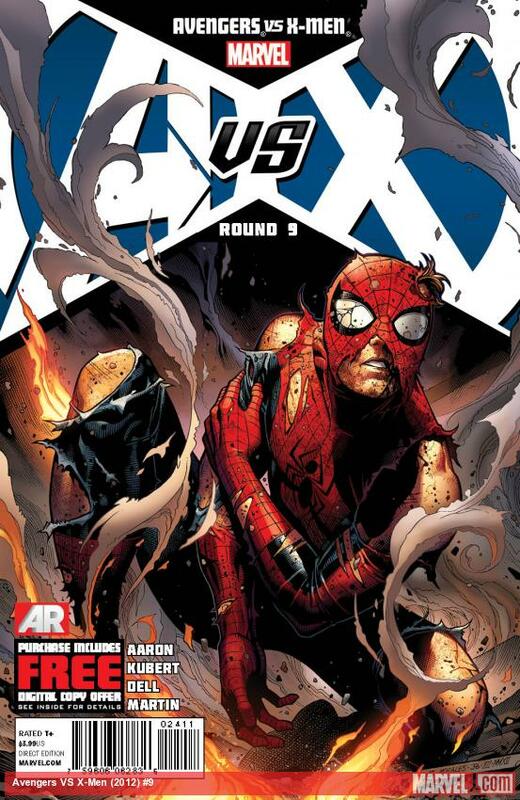 What will become of Peter Parker and Miles Morales,Will the encounter change them forever? When Peter returns to Aunt May’s at the end of issue #3, I mentioned that was anxious to find out how this meeting was going to pan out. I also said that the story would get more depth and more emotional. 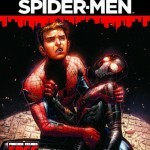 I was right to think so as Spider-Men #4 with Brian Michael Bendis fills this issue with lots emotional moments, something you would expect considering the tragedies of the Ultimate universe. Bendis nails it on this issue with the interaction and emotion between the characters as it is what makes this issue very solid. 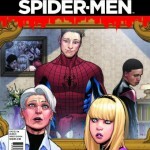 Each character has a different reaction to Peter’s return, most noticeably Aunt May’s anger and confusion which leads to her fainting, or MJ who is too hurt to even see him. 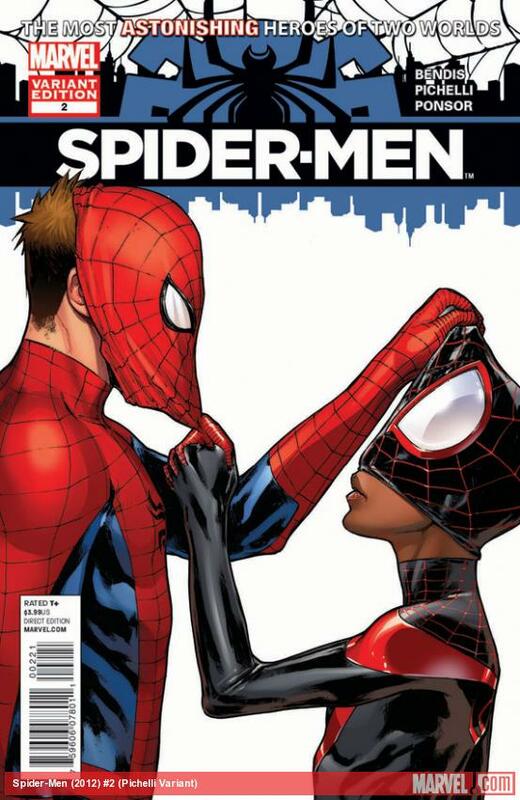 Then, there’s Gwen who at first is angered but quickly over it and acting like a normal teenager all the while young Miles is borderline obsessing over Peter’s web shooters. Every character has a different reaction to his appearance which I find exuberant. Once again Sara Pichelli brings all of Bendis work to life in this issue, accenting the moments of this series with emotional details. 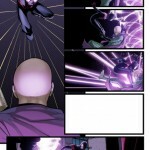 She visibly catches the moments that I noted earlier about with sharp attention in each panel. Pichelli’s work in this series and series of the past demonstrate that she is a master of detailing. Her work is always on point, from character designs, action movement sequences, page layouts and perspective. She is in my opinion, one of the best artists Marvel has right now and I know I’m not the only one who feels the same way. 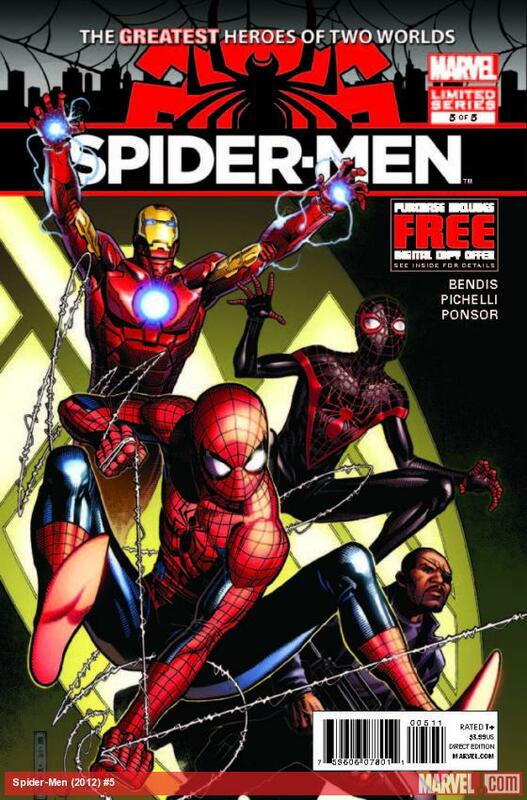 Final thoughts: When reading issues #1-4 you can tell that Bendis enjoys writing for Spider-Men, his work is very consistent while working in humor and delivering emotion in different situations. Every character is handled with a personal touch that brings out their unique feelings. 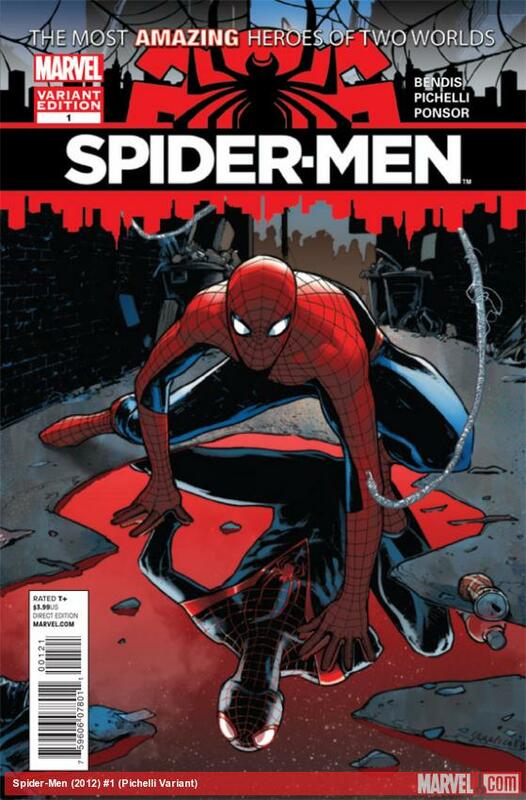 In the end Spider-Men #4 is the best issue so far and is a turning point for this story, hopefully Bendis can finish this off strong. 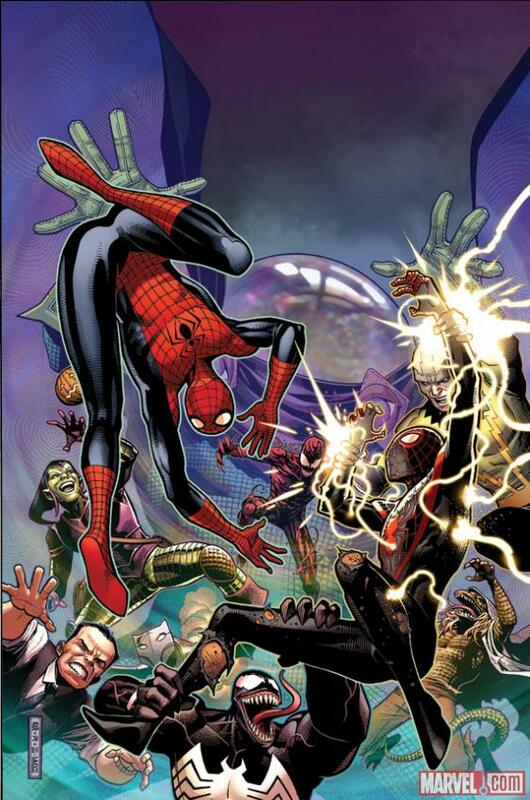 After blowing up the helicopter Peter and Miles confront the avatar of Mysterio, a brash Miles jumps into action without hesitation and is quickly taken down. 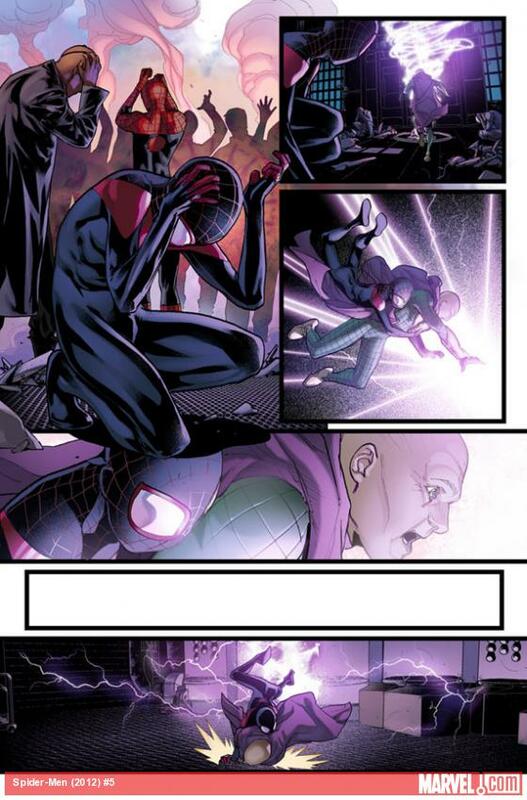 At that moment Peter begins to understand situation and tells the younger spider-man to step so he can handled it, but before he can come up with a plan they hit with one of Mysterio’s illusions and are attack by a barrage of 616 and Ultimate villains. 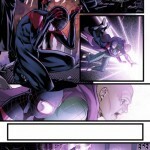 Form hear the action plays out with the two spider-men clashing with the likes of Green Goblin, Venom and Miles uncle Aaron, the action in this section is kinda straight forward with the two spidey’s taking down Mysterio quite easy, you would think when Miles is confronted by his uncle would produce some drama but that’s not the case here. 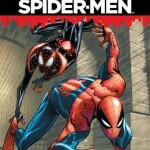 Bendis could have done alot of things here by inserting some humor or more emotion as the two tag team it out. 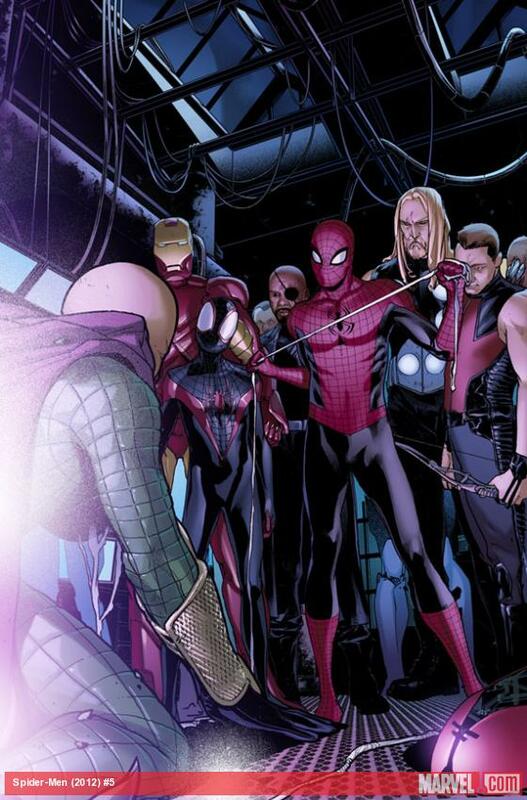 Form there the story picks up allitle bit when Nick Fury and the The Ultimates show up at the end of the Mysterio fight. 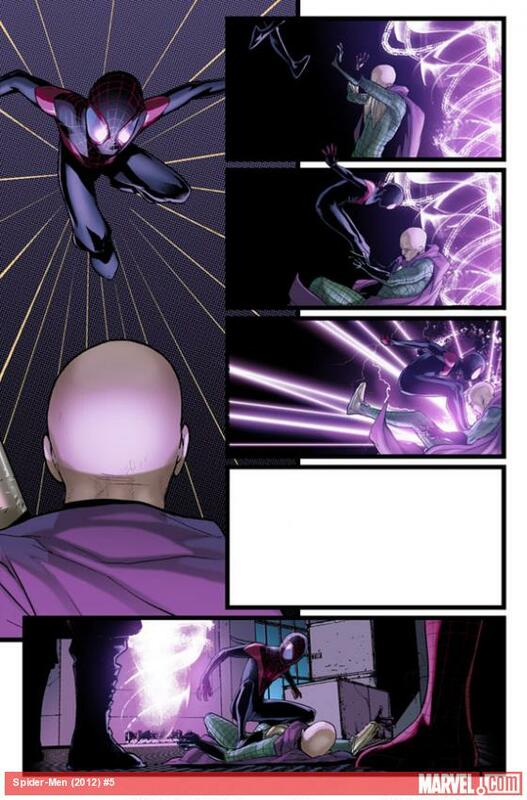 Bendis sheds more light on the tech Mysterio is working with, meanwhile peter takes off to resume his quest to find out what has exactly happened to the Spider-Man of this world. 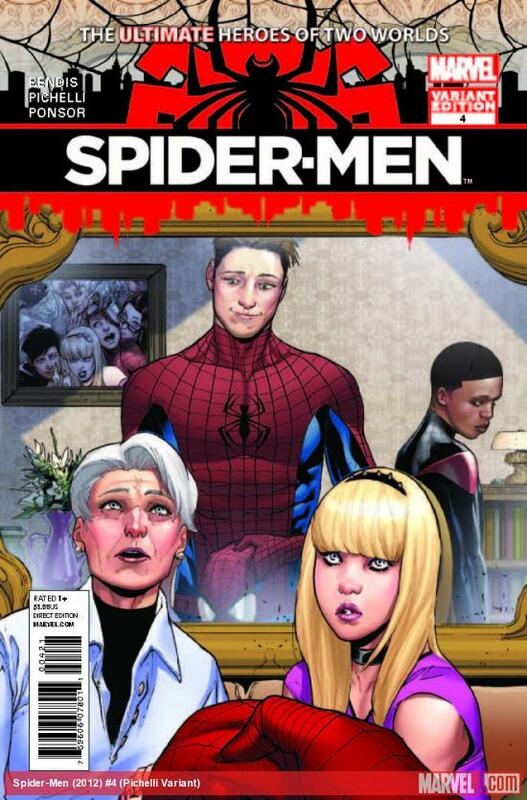 The last last few pages of this issues does show more emotion and the humor that was missing earlier, notably when Peter finds out the truth about himself and when he returns home and confronts Aunt May and Gwen. Although the script in this issue missed in alot of areas, the one thing that was a hit is Sara Pichelli artwork it’s very consistent in each panel action or non action, character figures are spot on as she blends the 616 and Ultimate villains together. 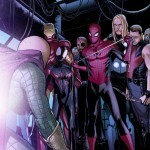 An unconscious Mysterio wakes up and notices that Spider-Man has falling through the portal, upset that Spider-Man has always gotten in his way he activates his avatar suit and walks through the portal declaring that he will get rid of Spidey once and for all. 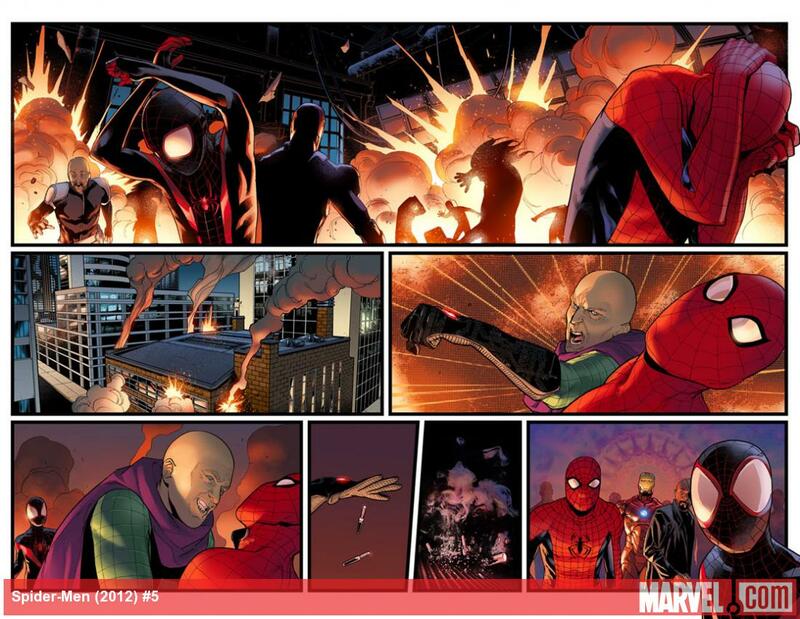 Meanwhile Peter Parker and Miles Morales stand face to face with Peter asking for answers the young Spidey can’t give, the conversion quickly turns into a little skirmish with Miles getting the upper hand using his Venom Strike to knock him out. The fight between the two is everything you would expect, Sara does a wonderful job showing the similarities and the differences in both characters from movements to fighting styles each is very distinguish and their own. 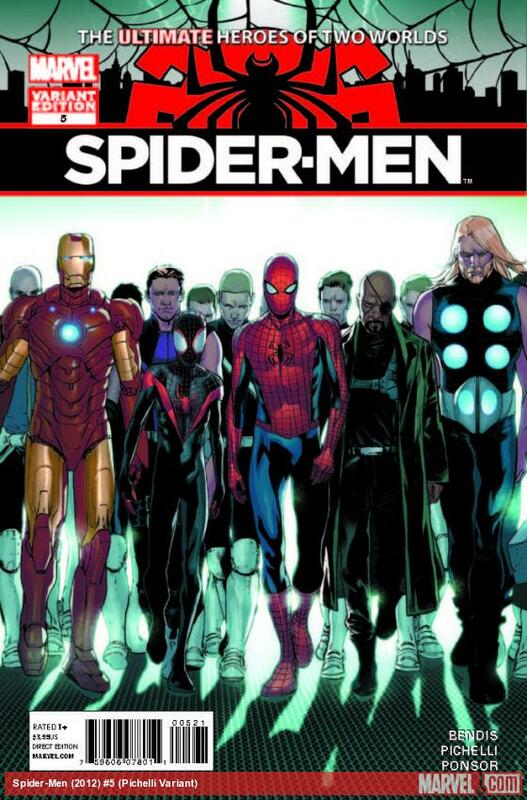 After a brief in-counter with Nick Fury who tells the younger Spider-Man to assist his mentor and tell him everything he needs to know about the world he’s in now and what happened to that Peter Parker, he also says he’s going to look into how Peter ended up in this world and the problems it may cause the longer he stays there. 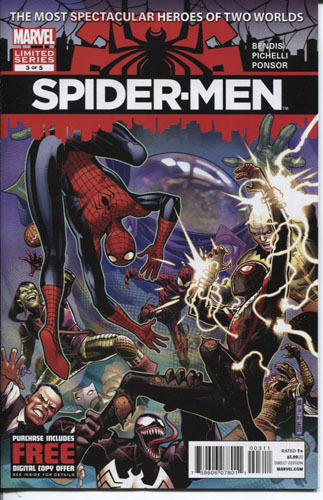 The two jump on a Shield helicopter and begin to talk once again, only this time it’s on a more serious subject and that’s the fate of this world’s Peter Parker, just when Miles is going to answer the big question of his fate Mysterio’s avatar shoots a rocket at the helicopter causing them to jump off. 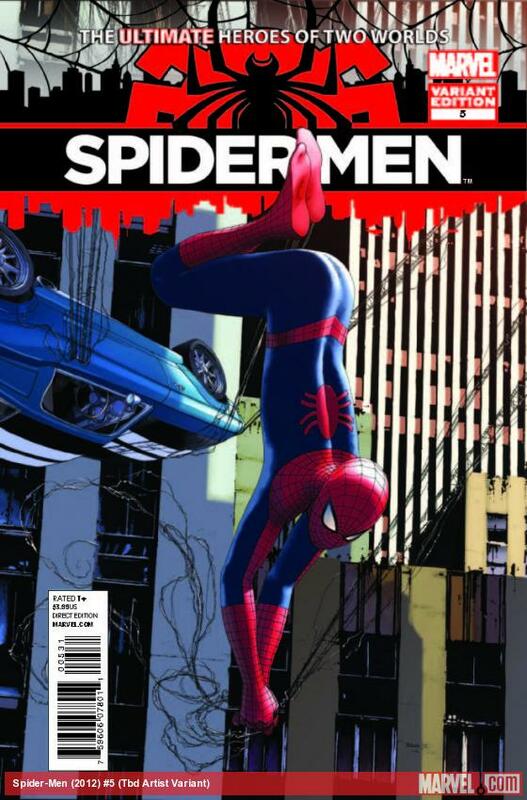 Issue #2 is exactly how I though it was going to be and that’s story development, Peter is trying to grasp the situation he’s landed in while the young Miles does the same thing as well, there are some comedic parts in this issue but its’ s more physical as each tries to unmask the other. But none of it would make sense without Sara Pichelli, her action sequences are some of the cleanest I’ve seen in a comic book, every panel is laid out nicely with solid well proportion figure work. 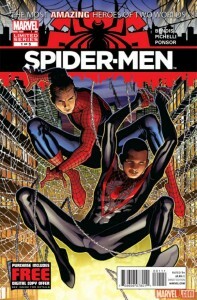 In the end Bendis opens up the story just a bit and gives the reader a nice little twist at the end of issue. 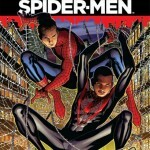 Spider-Men is combination of the two worlds (Marvel 616, Ultimate) or should I say Universes and there respective Spider-Man’s together in this nice debut of Spider-men #1 , Brian Bendis and Sara Pichelli team up the two Spidey’s in five 5 part series which promises to continue the same quirky humor the Ultimate series..
Spider- Men #1 starts in the point of view Pater Parker who you see swinging around New York City,He express’s his love of city in nice opening monologue. 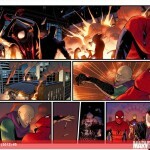 Bendis flows the character smoothly with a healthy dose of jokes while still keeping the monologue light. As a first issue I wasn’t expecting much to happened in the action department but more towards to development of the story, the little events that do occur are nothing the reader would be surprised of, But like I said didn’t expect much in a first issue only a bit of story development, I will say the ending sets up nicely for issue #2 and the potential it has to open up the story alittle more. 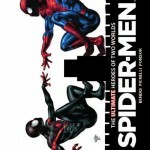 The plot is predictable and thin only because Bendis is setting up for thematic like events later on which begin to take shape in Spider-Men #2, With everything that has happened to Peter Parker and all things that transpire during the Ultimate series I’m eager to see how Bendis is going to establish Peter Parker in this world, and what effects he could possibly bring to the story once he and Miles Morales meet. 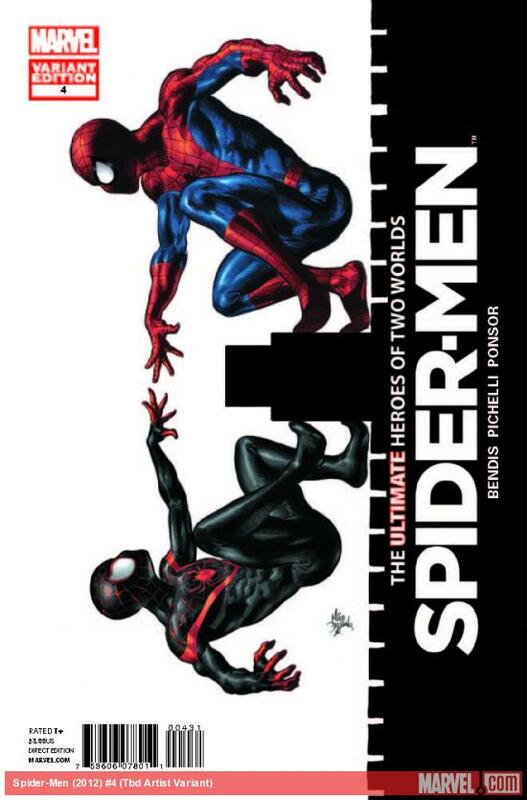 You can say the same thing for Miles Morales how will meeting Peter Parker the man that inspired him to take on the title of Spider-Man effect him, there endless possibilities for this story. 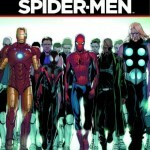 Bendis plans to establish the character first before jumping right in so new fans will able to catch on quickly. 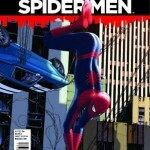 Artist Sara Pichelli who has contribute her talents in the past Spider-Man (Ultimate Spider-Man) does a wonderful job detailing the cityscapes and the facial emotion and body language of the characters her Illustrations visibly brings all the humor and action to light, as fan of work I think she matches perfectly with Bendis. 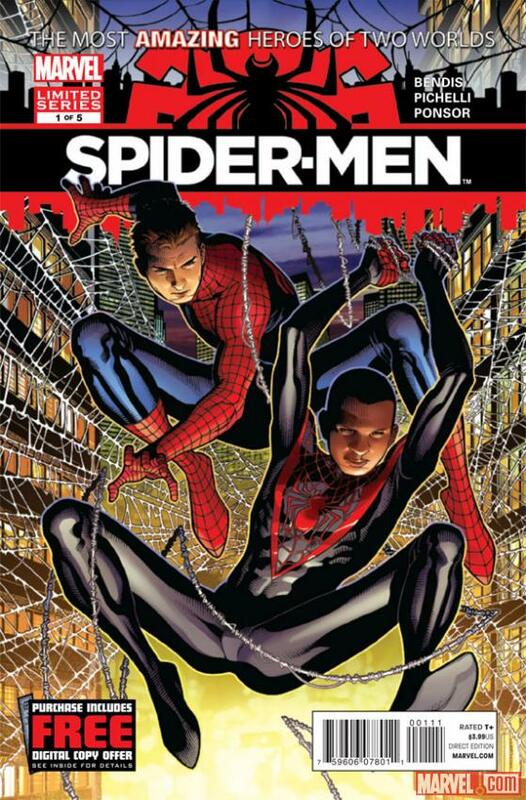 In the end I highly recomend fans to give Spider-Men #1 and try, It doesn’t jump out at you in the beginning but it does have the potential of some decisive moments that could change the worlds of both men..